Since Usher broke through with the release of his second album My Way in 1997, the R&B don has been unstoppable. To date, Usher has sold over 65 million records worldwide and has won 8 Grammy Awards—all while serenading your girlfriend. Usher—or Ursh! as #TeamUsher tends to call their boy—is simply the #1 stunna when it comes to R&B music…the numbers just don’t lie. Fast-forward to August 2014 and Usher is still making waves, as he debuted a brand new track with Nicki Minaj at the 2014 MTV Video Music Awards. It went something like this. Then Usher announces the first round of cities for his UR Experience Tour via usherworld.com and his retweet twitter contest. Go #TeamUsher! Catch Usher live during his UR Experience World Tour and pickup Usher Tickets today. So let’s bask in the #TeamUsher greatness and look back at 10 Usher music videos that’ll get you pumped for the UR Experience Tour. 1. Usher – Call Me a Mack Usher’s introduction to the world via the Poetic Justice soundtrack. Usher was only 14 years old, ’nuff said. 2. Usher – You Make Me Wanna Oh how the Usher clones, undeniable hook and So So Def-backed production launched Usher out into the world with the first single off his breakthrough second studio album, My Way. 3. Usher featuring Young Jeezy – Love in this Club Ah, the dynamic duo of (then) monstrous hip-hop artist Young Jeezy and Usher. The two combined their hip-hop and R&B greatness for a lusty, club favorite. 4. Usher – My Way There are few people who can get away with sharing a song title with Frank Sinatra, but Usher pulls it off with the kind of self-confidence only Usher could. This song had a nice #2 spot on the charts during its run in ’97. It likely would have been #1, but Brandy and Monica were busy cat fighting it out with The Boy is Mine. 5. Usher – You Don’t Have to Call It doesn’t get any better than this. First, you take Usher and pair him with the Neptunes—who, in 2001, were firing on 16 cylinders like the finest Bugatti Veyron you ever saw—for an amazing anthem. Don’t forget about the remix with Ludacris on the raps. So epic. 6. Usher – My Boo Alicia Keys and Usher. So much soul, so much swoon. Seeing as it’s been 10 years (!) since this song was released, we think it’s high-time for these two to work together again. Just sayin’. 7. Usher – You Got it Bad Featuring his then girlfriend Rozonda “Chilli” Thomas of TLC, Usher’s U got it Bad only enjoyed 1 week on the top of the charts before getting bumped by Nickelback. Oh how the times have changed. 8. Usher – Yeah Arguably, Yeah is one of the best hip-hop songs to ever hit the clubs. Featuring both Lil Jon and Ludacris, this track from Confessions enjoyed a #1 spot at the top of the charts for a 12 week run in 2004. This song is still a fantastic hit to play during any house party, cruise in a drop top, wedding or workout. 9. Usher – Confessions, Part 2 Staying true to the album’s name, Usher didn’t hold anything back on Confessions—his most popular album to date. And while we love the Part 1 track, Confessions – Part 2 was the one that made it to the mainstream, giving us an emotionally torn Usher belting out some dirty laundry through the dramatic lyrics. 10. Usher – Climax Rolling Stone and Entertainment Weekly named Climax one of the best singles of 2012. Then in 2013, the hit won a Grammy Award for Best R&B Performance. That’s what happens when you combine Usher and Diplo. Check out Usher’s newest track with Nikki Minaj and the UR Experience World Tour Trailer. 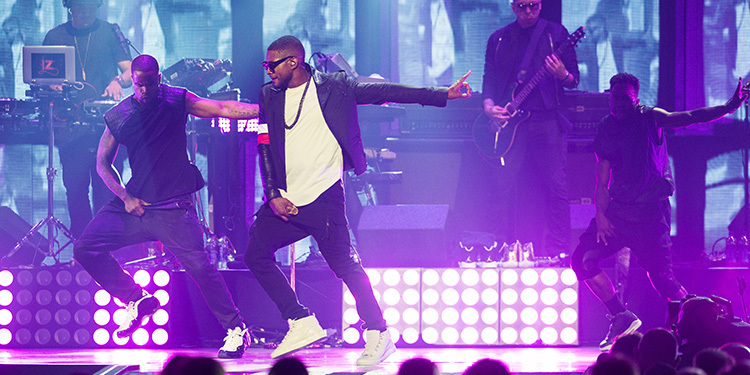 Catch Usher live during his UR Experience World Tour and pickup Usher Tickets today.